PPatron: First Sea Lord, Admiral Sir Jonathon Band, KCB. As Newsons development is virtually complete expect 102 to be based here permanently on the new pontoon. Set of fenders and ropes to be left on pontoon for ease of operation. Any questions, give me a call on 01603 782068. 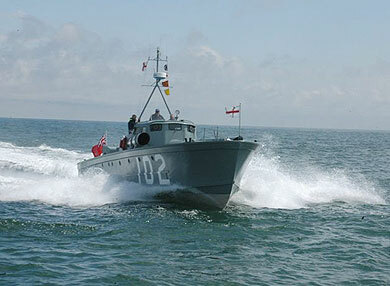 MTB102 has a fairly busy summer ahead and as we usually only operate with a crew of four or five on board we have decided to offer places in the crew to interested persons to experience life on board a torpedo boat in exchange for a donation to the MTB102 Trust of £150 per day at sea with a maximum of six. You won't be passengers and will get to have a go at most things onboard. This is an oportunity not to be missed for enthusiasts. We do have age limits set by our insurers of between 18 and 70 years old. Also remember that MTB102 is all vertical ladders so you need be reasonably fit. For contact details see our web site at www.mtb102.com. Email us by clicking here. Length: 68' 0" (69' 6" including rudders). Draught: 3' 2" to 4' 10" depending on armament carried. 4 Main Stringers: 2 inner, 2 outer. Inner Main Stringers: 12" x 2" Oregon pine, reinforced with 12" x 2" through bolted, steel angle from Fore Peak to Transom. Outer Main Stringers: 9" x 2" Oregon pine reinforced with 9" x 2" through bolted, steel angle from Forecastle to Aft Peak. Frames: 7" x 1¼" sawn mahogany with 28" spacing. Secured to main stringers with through bolted, steel angle brackets. Gunwhale: 3½" x 3" Canadian Rock Elm (CRE). Chine: 3" x 3" CRE. Ribs: 1½" x 7/8" CRE with 9" spacing, between frames. Stem, Stern Post and Knee: English Oak. Floors (added after first trials to stiffen bottom): 7" x 1¼" sawn mahogany midway between frames, steel brackets to chine. Topside Planking: Inner: ¼" mahogany x 6". Outer: ½" mahogany x 6". Bottom Planking: Inner: and middle: ¼" mahogany x 6". Outer: ½ mahogany laid Fore and Aft. Rubber, Chine Rubber, Deck Stringers and Keel: CRE. Bulkheads: 3" x 1¼" mahogany stiffeners diagonally planked 4" x ¼" mahogany in 2 layers. Decks: Inner: 6" x ¼" mahogany, laid diagonally. Outer: 6" x ½" mahogany, laid Fore and Aft. All diagonal planking is interlaid with oiled calico for water proofing. Knees, hanging knees and most joints reinforced with through bolted, 14G galvanised Mild Steel plates. Wheelhouse: Birmabright aluminium, shaped and riveted. Deck Fittings: Aluminium, probably of Vosper manufacture. 57 litres, 18 cylinders in 3 banks of 6, 4 valves per cylinder with ohc, 6 throw crank with articulated conrods, 1100hp each. Unsilenced. Fuelled by aviation spirit. Centre Engine: Through a "V" drive. Gear Boxes: Straight through ahead drive. Reverse through planet gears controlled by brake band. Multiplate steel / bronze clutch. Auxiliary Engines: 2 Ford V8's, Vosper marinised. Coupled to outer shafts for manoeuvring / berthing / generator. Silenced. Shafts: Stainless steel, 22" diameter. Steering Gear: Bronze rudders, bearings etc. Cable operated from wheel and drum in wheelhouse, with extension shaft to wheel on bridge. Fuel Tanks: Admiralty brass, shaped, riveted and soldered. 3 tanks each of 330 Imp gal capacity. Fuel Consumption: 230 Imp Gals per hour at full throttle. Maximum Speed: Official: 47.8 knots. When she was bought by a Norfolk scout group, eventually transferring to the Norwich Area Scout Council. 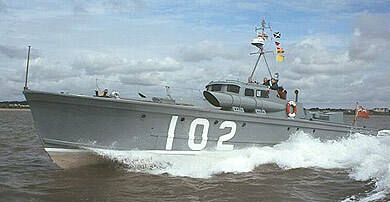 MTB102 was operated by this organisation until 1995 when she suffered a major engine failure. 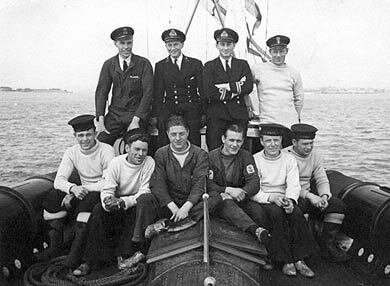 When it became clear that the Norwich Area Scout Council would no longer fund the operation and maintenance of the vessel the operational crew under the leadership of Chief Engineer Richard Basey, put forward a plan for the future of MTB102 and she was duly handed over. 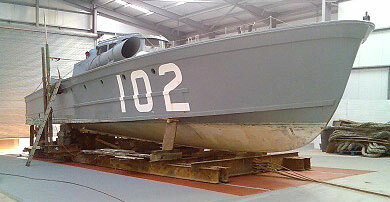 The MTB102 Trust was established in 1996 to fund the operation and maintenance of Motor Torpedo Boat 102. At the time the vessel was in a poor state with an expensively damaged port engine in need of considerable expenditure and much care and attention needed on the vessel as a whole. Within 12 months of taking over the vessel two new engines had been purchased and much time spent on the structure to return MTB102 to full sea going condition again. The maintenance policy of the Trust since then has been to slip the vessel every year and carry out any essential repairs required and, as and when funds permit, to carry out a planned programme of improvements to the vessel structure. This system has been very successful and has resulted in a gradual improvement in the condition of the hull and fittings. All finance for this programme has been generated by appearance money at various maritime events and by our sister organisation, The Friends of MTB102, by subscriptions and souvenir sales. We have had no grants at all despite applying to various bodies both of a maritime and historical nature. Also the Trust does not pay expenses to any of its trustees or members. All is voluntary! We have persuaded over thirty companies to sponsor MTB102 in various ways and their help is vital to the survival of MTB102. These range from one man businesses to major international companies.